There are some things about being married to a funeral director that are not so fun. Like when they go to school to learn their trade, for instance. I spent two years listening to my husband say, “You won’t believe it. They do the coolest thing with…”. Of course I don’t know what he ever said after that because at that moment I always scrunched up my eyes and covered me ears and said, “LA LA LA! I CAN’T HEAR YOU!” until he stopped talking. The hours of a funeral director aren’t that great, either. I recognize that our family is not as bad off as others, since my husband doesn’t own his own funeral home. We don’t live upstairs and have him answering the front door in the middle of dinner. He does work brutal weekend shifts every few weeks, mind you. From Friday to Tueday every three weeks he might as well be out of town for all he’s home. Then there’s the constant presence of death. When he comes home from work and I say, “How was your day, dear?” (yes, I really say that) I always know that there will be some kind of a sad story in his answer. “It was a stillborn at 36 weeks,” he’ll say. Or, “It was a teenager. They’re still not sure what happened.” Thankfully old people die, too, and sometimes their funerals are a celebration of a live well-lived. Still, it’s not all bad. This week I actually enjoyed one of the perks: flowers. Sometimes families don’t want to take them home, and there is no church or retirement home to deliver them to, either. When that happens, my husband brings them home to me. I love that. I know you might think it’s depressing, those funeral flowers. But more and more those flowers are not the big sprays of gladiolas in white cardboard containers of our grandparents’ era. They are often modern designs in pretty vases, with birds-of-paradise, gerbera daisies and orchids. 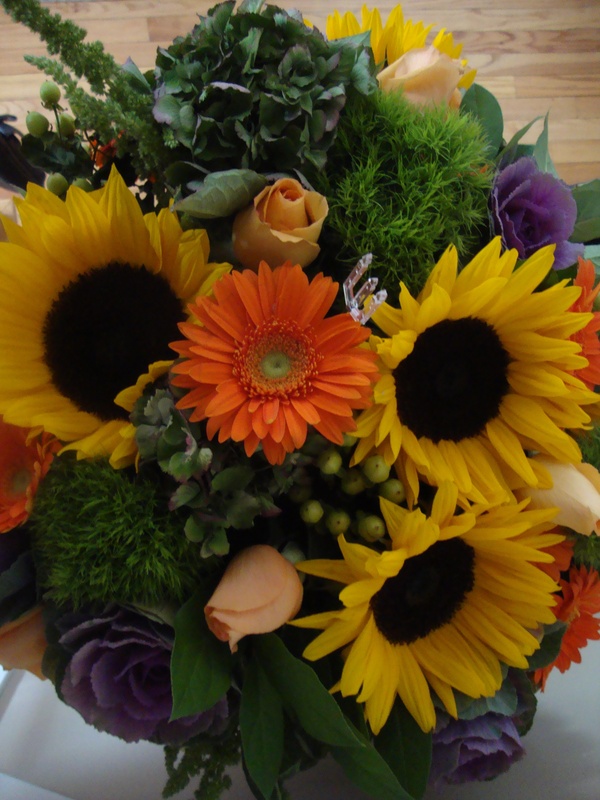 This week I have a lovely fall arrangement in the living room, full of sunflowers and purple cabbages. 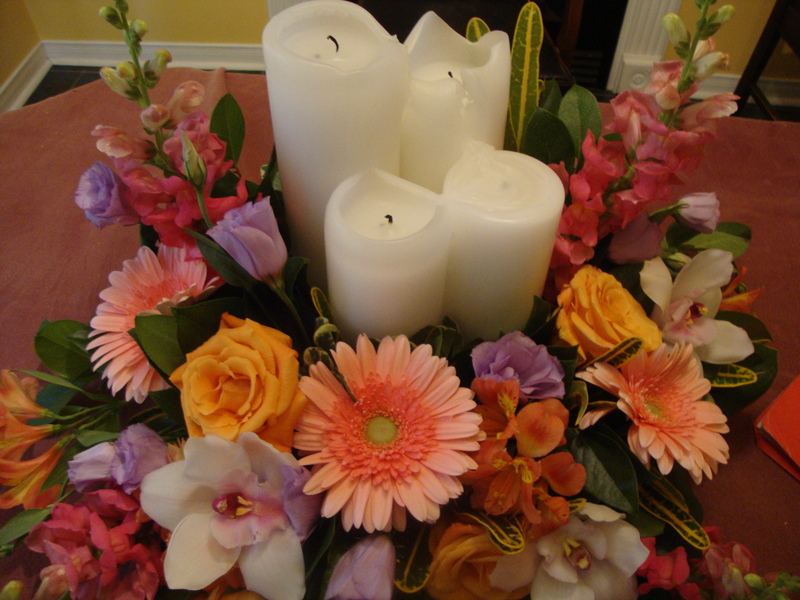 The kitchen table has a pretty pink arrangement, too, with four white pillar candles in the middle (I lit them one day last week while I worked at home for the afternoon). I enjoy those flowers for two reasons. First, I love flowers and welcome their beauty in my house. Second, I am keeping them from being tossed in a dumpster. Instead, I enjoy them and then compost them in the backyard when they are finished. I have even arranged with a local florist to return the glass vases and wicker baskets that are in good condition. It all feels very earth-friendly. I still tell my husband that there are things in his job I would rather not know about and the grief and sadness we encounter can be heart wrenching. I will, however, take all the flowers he brings home. This entry was posted in Uncategorized and tagged family, flowers, funeral. Bookmark the permalink. I’m sure that the people that don’t want the flowers back at their home are thankful that they are being enjoyed by someone. When my father passed away, my mother gave all of our neighbors flowers. She knew that they would enjoy them and remember my father.